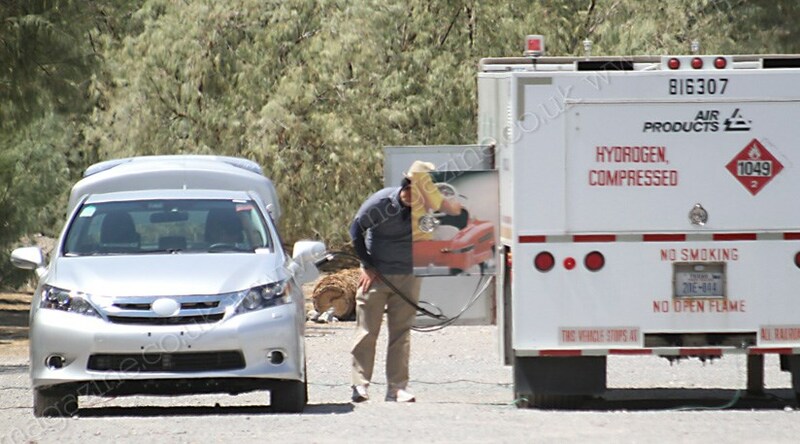 A week after Toyota confirmed a hydrogen fuel-cell project, a Lexus HS has been spied testing in the heat of Death Valley, USA. Unremarkable, you say? The car may look conventional, true enough, but it appears there's a radical new powertrain under the skin. Spotted refuelling from a hydrogen-labelled truck, Lexus could be about to embark on a sea-change in the way its cars are powered. Wait, aren't Lexus a hybrid-centric brand? Correct - everything from the CT200h hatch to RX450h SUV proudly wears its status as a 'premium luxury hybrid' on its sleeve, or rather on little badges fitted on the rear doors. The Lexus HS in these pictures has the same tell-tale recess, but no badge. The question is, what will the badge read: hybrid, or hydrogen? Toyota announced earlier in August 2012 that it is wiorkingt on a hydrogen saloon, due to launch in 2015, though it's not yet clear if it'll be badged as a Toyota or Lexus. Neither company were able to confirm our query when contacted by CAR. Would this Lexus be the world's first hydrogen fuel cell-equipped car? Nope - Japanese rivals Honda beat everyone to the game back in 2008. Until now, the main hydrogen-fuelled automobile to gain any real public recognition was the Honda FCX Clarity - a normal-looking four-door which boasted no harmful emissions and internal combustion-equivalent performance. Although a promising stab at the world of hydrogen-powered cars, the project was hampered by the scarcity of hydrogen-equipped filling stations, limiting the leases to only around 50 vehicles, split between Southern California, Europe and Japan. So what's the point in Lexus building a hydrogen-powered saloon? The real point of Honda's FCX Clarity was not the car itself, or the very shaky business case, but more the vindication of an idea. Because of that, more hydrogen stations are popping up on the West Coast of the US, which could make hydrogen cars a far more viable proposition. The environmental case remains the same: hydrogen fuel cells create electricity to propel a motor - it's currently the holy grail of the industry, thanks to petrol-rivalling performance, the ability to refuel on the go and zero-emissions (other than H2O).